Contrived headline of the day goes to the Crawley Observer for “When winger Robert had no Cure for defeat”, as they have have just unearthed a picture of Robert Smith from 1975 (when he was 15 and three quarters), and played on the wing for . Aaaaaagggghhhhhh! Can you spot the soon-to-be music legend in this line-up of young footballers? We have Observer reader and music man Gary Mayhem to thank for turning up this gem. Gary’s email: “If you look at The Crawley Observer, Friday March 21st 1975, page 67, yes, that is Robert Smith of The Cure at 15 years and 11 months young” had some of the older members of staff scurrying for the archive to find the edition in question. The picture quality isn’t brilliant, but spending almost 40 years in a cupboard sandwiched between 1955 and 1969 is likely to make anyone age badly. 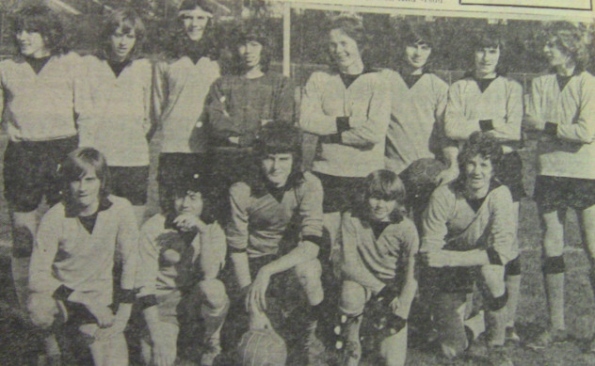 The picture shows the boys of the Wasps (Three Bridges) football team, who were beaten 2-3 by Shoreham in the Sussex Minor Cup. The match was played at Haslett Avenue. via When winger Robert had no Cure for defeat – Local – Crawley Observer. via Chain of Flowers – never caught off-side!